Poor Ndume. Over 3,000 people tried to convince Cincinnati Zoo and the AZA Gorilla SSP to end Ndume's isolation at The Gorilla Foundation, but those efforts have evidently failed. 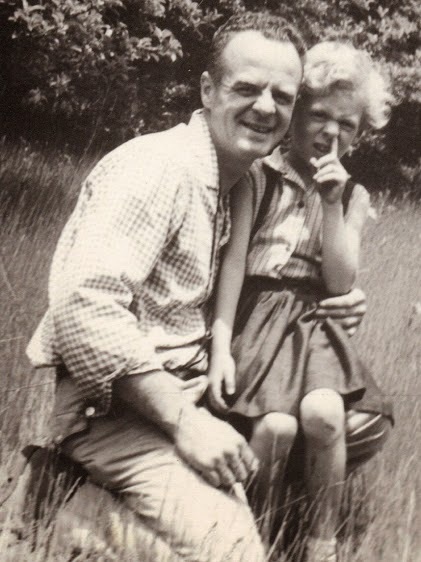 It may be because of the reason that former Ndume caregiver John Safkow wrote: "He's too screwed up for a zoo." 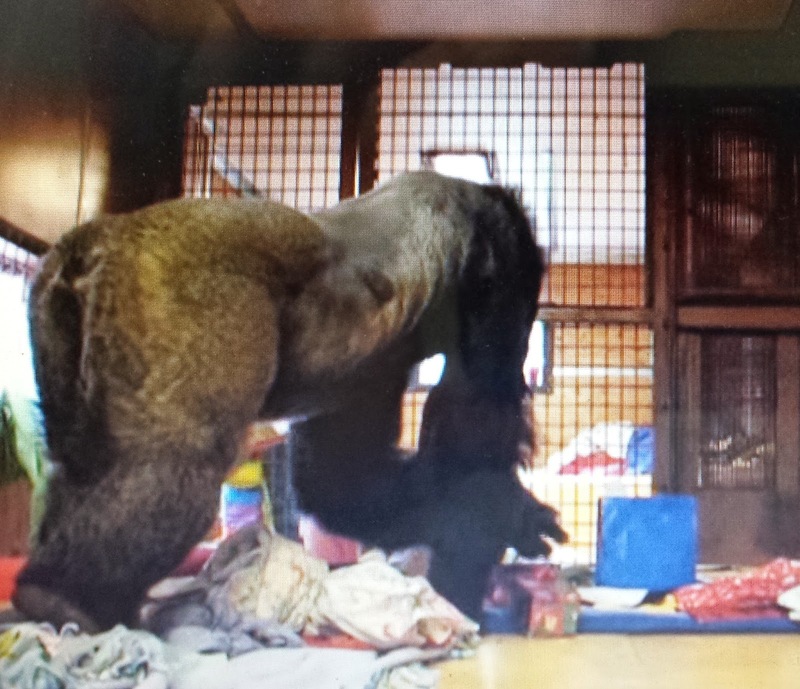 Decades of living in a trailer can do that to a silverback. Ndume gets junky "enrichment" on his birthday. Recently, the zoo's public relations department started sending FB critics a message asserting, despite voluminous first-hand evidence to the contrary, that Ndume was receiving enrichment and socialization at TGF, and was in daily contact with Koko. We know that Ndume and Koko do not, in fact, come into daily contact. They don't have any physical contact, period. And enrichment? The "enrichment" activities are enough to drive any silverback crazy, if you ask me. On "sock day," caregivers tie socks with nuts and treats inside. On "box day" Ndume gets treats inside cereal or other food boxes. On "clothing day," Ndume gets articles of old clothing stuffed with nuts and treats. On "pill bottle day" (caregivers say they always had hundreds if not thousands on hand from all of Koko's required pill popping), caregivers would put nuts and treats in pill bottles and scatter them in the yard. Then there was the glorious "scatter day" with bare stuff placed around the outdoor enclosure. If that is "enrichment," then I'm a monkey's uncle. 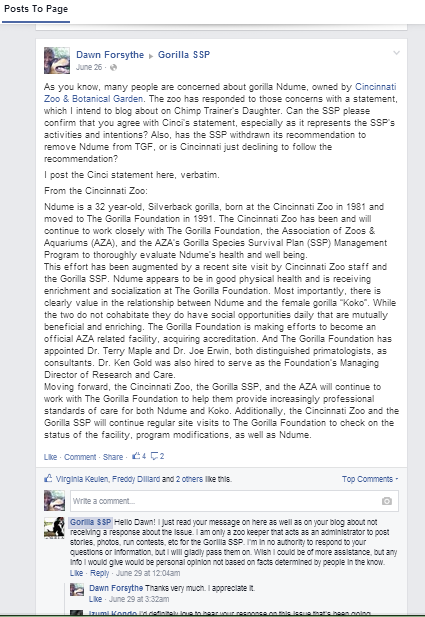 Over a month ago, I asked the Gorilla SSP if they agreed with the zoo's assertions. I asked if they had withdrawn the recommendation in the draft gorilla management plan that called for the zoo to bring Ndume back into the zoo population. Still no answer. In recognition of reality, I have ended the petition calling on the Cincinnati Zoo to bring Ndume out of his isolation. If Ndume is too far gone for integration back into normal zoo populations, and there are no gorilla sanctuaries in the U.S., then it looks like he'll have many, many more "pill bottle days" at TGF. I'm sure he appreciates the enrichment. It is enrichment. Might not be the best of the best but at least he is getting something. I stand by the Gorilla SSP and believe they are doing all they can and keeping up to date on his situation. It's pretty neat when someone declares that they "stand by" a decision or an organization. People have to respect that. I must say, however, that when most people "stand by" something, they identify themselves. Otherwise, I don't think it counts. Why aren't there any gorilla sanctuaries in the US at this point? Seems like they should already exist.